In 1860, ​Emperor Napoleon III redivided Paris into twenty arrondissements (municipal districts), with the 1st arrondissement located in the historic center, near the left bank of the Seine, and the 19 remaining districts spiraling out clockwise. Each Paris arrondissement, often comprising several neighborhoods, has its own distinct flavor and cultural attractions, so if you're looking to figure out what to see in the area where you're staying, this guide is a good starting point. To get an even better understanding about how Paris is laid out geographically in relation to the Seine river that cuts through it, you may also want to learn about the Rive Gauche (Left Bank) and the Rive Droite Right Bank) in Paris. The heart of what was once the seat of royal power in Paris, the 1st arrondissement retains an atmosphere of elegance and regality. Paris' somewhat under-appreciated 2nd arrondissement harbors attractions most tourists never see, including a medieval tower and one of the best open market streets in the city. Often referred to as "Temple" after the medieval fortress that once stood in the area and was built by the military order known as the Knights Templar, Paris' third arrondissement sits near the heart of the city and combines bustling commercial areas with quiet residential streets. Paris' 4th arrondissement houses some of the city's major historical sites-- including Notre Dame Cathedral-- but it's also a strong symbol of contemporary Paris, harboring diverse and bustling neighborhoods like the Marais and "Beaubourg" and attracting artists, designers, trendy shopkeepers, and students. The historic heart of the Latin Quarter, which has been a center of scholarship and intellectual achievement for centuries, Paris' 5th arrondissement remains a major drawcard for tourists thanks to sights such as the Pantheon, the Sorbonne University and the botanical gardens known as the Jardin des Plantes. The 6th arrondissement of Paris, once the stomping ground of mid-20th-century writers and intellectuals, is today a posh hub for designer boutiques, antique furniture and art dealers, and lush formal gardens. 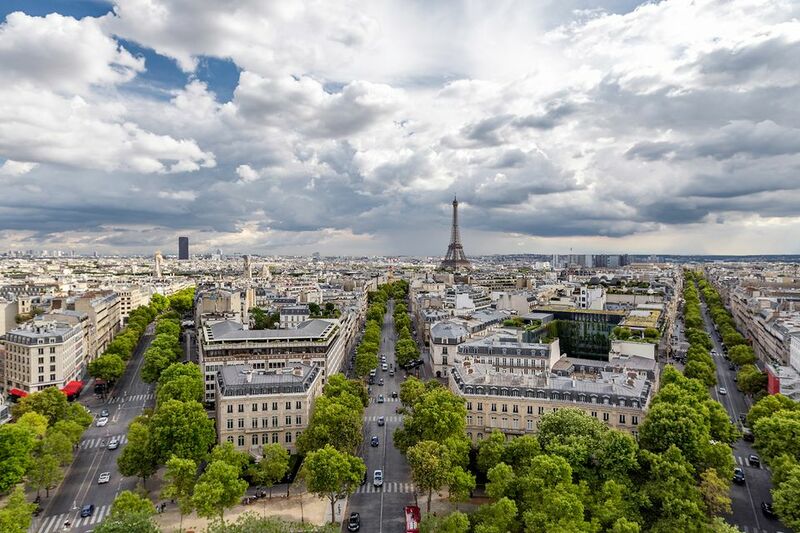 The 7th arrondissement (district) of Paris is an affluent, highly prestigious part of the city that attracts droves of tourists to essential Paris sights like the Eiffel Tower and the Orsay Museum. Accommodations here will cost you more and don't expect to see many average Parisians in this area. Located near the city center, Paris' 8th arrondissement is a bustling center of commerce and the home of famous attractions including the Arc de Triomphe and the Champs-Elysees. Paris' 9th arrondissement is a stately area well-known for its Belle-Epoque department stores and elegant shopping galleries, popular theaters and hilly residential streets. The 10th arrondissement is little-known to tourists but houses hidden gems such as the Canal St Martin neighborhood. This edgy working-class area is just a stone's throw from the bustling city center and is increasingly attracting young professionals and artists. The 11th arrondissement of Paris is an edgy, ethnically diverse area of the city that houses sights such as the Place de la Bastille and its majestic modern opera house. It's also a huge draw for students and fans of nightlife, offering a disproportionate number of the city's hippest bars and clubs. Paris' 12th arrondissement (district) is a somewhat lesser-known part of the city that notably houses historic train station Gare de Lyon and the Bois de Vincennes, an enormous park known as Paris' "lungs". The 13th arrondissement is a relatively uncharted area of Paris that's exemplary of a shifting contemporary Paris. The area notably houses a lively Chinatown and the sprawling, ultramodern National Library. Comprising the legendary Montparnasse district, once home to a lively arts and literature scene in the roaring 1920s, the 14th arrondissement has a lot to offer. Paris' 15th arrondissement is a relatively uncharted area of the City of Lights that features charming residential streets, a waterpark, and the city's largest convention center. Situated in the southwest part of the city's left bank, the 15th arrondissement is quiet and unassuming but has many charming nooks. The 16th arrondissement is an elegant, upwardly mobile area of Paris which houses important museums such as the Claude Monet/Marmottan Museum and the Palais de Tokyo, in addition to quiet, charming neighborhoods like the area known as Passy. The 17th arrondissement is a somewhat unchartered area in the northwest corner of the city that combines quiet upper-middle-class neighborhoods and spots such as Place de Clichy, formerly seamy areas frequented by 19th-century artists including Edouard Manet. Thanks to its sweeping viewpoints, art-drenched history, and charming, village-like streets, the 18th arrondissement is one of Paris' most-frequented areas. In addition to charming (and famous) Montmartre, this arrondissement also includes lively, bustling immigrant neighborhoods such as Barbes and La Goutte d'Or. Situated in a northeast corner of Paris, the 19th arrondissement has until recently been considered of little interest to tourists. Yet the area, which is undergoing a dramatic urban renewal, has a lot to offer. It notably features a sweeping romantic-style park, lively cinemas, and a science and industry museum. Paris' 20th and final arrondissement is a gritty working-class area whose immigrant roots, stately Pere Lachaise cemetery and surprisingly quiet stretches lend a particular charm. Decrypting Paris: What Exactly Is The Rive Gauche (Left Bank)?